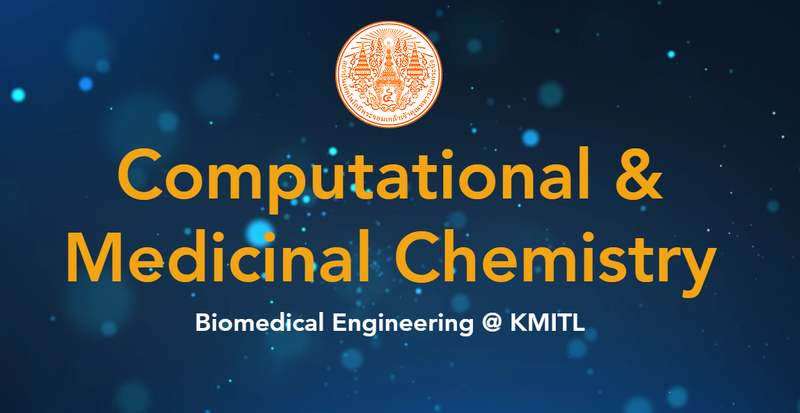 The Computational and Medicinal Chemistry Laboratory (CMCL) is located within the Department of Biomedical Engineering, Faculty of Engineering, King Mongkut's Institute of Technology Ladkrabang. Our research interests lie in the Pharmaceutical Engineering field, a multi-disciplinary area that encompasses the fields of Chemistry, Physics, Biochemistry, Biology, Engineering and Medicine. ​There is an opening for a fully funded Ph.D. position: Click here for more details (pdf). The search for new molecules to treat diseases such as cancer and malaria continues. Academic groups have an important role to play in the search for new lead compounds and targets with which new drugs can be developed. We are interested in applying rational design to develop new compounds for a range of neglected diseases including anti-microbials, anti-cancer and anti-malarial agents. Criteria for selection of a new chemical series for synthesis include (a) ease of chemical synthesis, (b) chemical novelty and (c) information derived from molecular modelling and cheminformatics studies. Compounds are then synthesized in the laboratory, characterized using NMR (C & H), mass-spectrometry, in terms of purity via HPLC-UV. The compounds are ​then tested for biological activity in the laboratory of our collaborators. Structure-based design of kinase inhibitors. ​Structure based design is the process whereby inhibitor of a given target can be optimized by analyzing the known protein-ligand structure. In contrast, ligand based design is performed based on an analysis of known modulators alone, without input via the structure. Both methods offer different advantages when (a) optimizing target affinity or (b) scaffold hopping from one series to another in an effort to improve the overall chemical / biological profile. 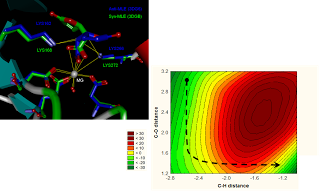 Hybrid quantum mechanical / molecular mechanical models (QM/MM) of proteins can be used to accurately simulate protein reactions, or gain insight into subtle chemical interactions within proteins. In this method, the region of interest is simulated using quamtum mechanics while the steric and electronic effects of the surrounding protein can be treated using an MM potential. These types of calculations have been used extensively to look at the reaction mechanisms or proteins whose mechanisms are not yet clearly understood, or to improve results from docking and scoring experiments. Drug discovery is an immensely complex endeavor, taking 15 years on average and costing 100,000,000s of dollars. However, with attrition of clinical candidates running at ~96%. There is a clear understanding within the field that a vast amount of work is needed to increase our efficiency in finding new drug molecules. One means to do this is from the cheminformatics based analysis of legacy drugs, failed development compounds and pre-clinical compounds that never progressed. Such analyzes will help us to identify what types ​of compounds and what types of molecules have a greater probability of success for a given disease. This work require a good understanding of biological and ADME process, physical properties of molecules, information extraction and statistical analysis methods. Biosensors developed using polymer based materials coupled with electronic circuits offer a relatively cheap and effective way of monitoring biological samples for aberrant proteins or virus, or the environment for pesticides and other chemicals. In collaboration with the group of Dr Chak Sangma at Kasetsart University, we are interested in applying polymer chemistry to develop molecularly imprinted polymers (MIP) with specific recognition sites for molecules or macromolecules of interest. The main goal of the project is to work with colleagues in Electronic Engineering to develop cost effective, accurate methods for sample analysis.